Creative children's ministry resources abound here in The United States. We are truly blessed to have at our fingertips a TON of creative ways to share the Bible with children. 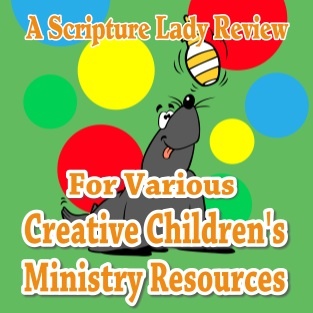 Here is a review of a few favorite creative children's ministry resources that hopefully will become part of your library. I LOVE creative children's ministry resources. Creativity is one of the main cornerstones for any children's ministry. Today's child is inundated with captivating graphics and visuals that are constantly vying for their attention. You need to make sure that your Sunday School room or even home is also full of creativity when sharing the Bible. In this post, I want to review 3 of my favorite creative children's ministry resources that are 3 great books for any children's ministry library. Rainbow Books is a GREAT publishing company based out of San Diego, CA. They have a really nice series of books that begin with the number "52," which provides enough creative ideas to teach the Bible every week of the year. Their books are easy to follow and the ideas are easy to implement within a classroom or home. I especially like 52 Ways to Teach Memory Verses because it provides 52 different ways to memorize Bible verses - something every teacher and parent should encourage their children to do. I like how the book tells you the appropriate age for the activity. Their books are also filled with cute drawings to help you understand the activity a little better. Click on thumbnail below to get your copy. I usually always love anything put out by Gospel Light, but this book is one of my favorites. I have referred to it over the years because of the creative ideas it gives. This book lassos the premise that all kids love animals. So, if kids love animals, then maybe they can learn more about God from animals. For example, did you know that the lion can teach your children that God is patient? Or did you know that you can learn that God wants us to be peacemakers from the black bear? This book showcases 52 animal "sermons" that will delight your kids along with fascinating animal facts all presented in a kid-friendly way. If you know me, you would know that I LOVE Bible object lessons. Simple Science Object Lessons is definitely one of my favorite creative children's ministry resources. I have even talked about this book in my teacher training workshops that I offer. This book presents some really fun scientific experiments that can be used to teach your children more about God. Some of my favorite experiments are "Faith First," "Absorbing God's Love," "Brick in a Box," and "Keeping the Faith." This is a must-have book for any children's ministry library. If you would like Kathy to creatively share the Bible with YOUR kids, please contact her via email at thescripturelady@gmail.com.